A CALL TO DUTY. John Kestner looks at the more than 800 names of the dead and missing members of the 103rd Infantry Division. Just before you reach the Texas/Oklahoma border (just north of Gainesville) on I-35, there’s a Texas Department of Transportation Travel Information Center featuring a large memorial to the soldiers of the 103rd Infantry Division. Coming back across the border it’s a little easier to spot. 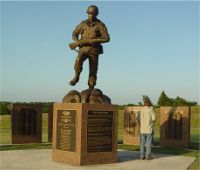 The memorial features a 9-foot sculpture (A Call to Duty) of an infantryman, sculpted by Edd Hayes. The 103rd Infantry Division was activated 15 November, 1942 -- Trained at Camp Claibourne, La. and Camp Howse, Tx. Many were transferred to combat duty as replacements, early 1944 ASTP (Army college students), Air Corps and others were assigned to bring the division up to strength. Unit sailed 6 October 1944 from New York, arrived Marseilles, France 20 October 1944. Relieved the 3rd Infantry Division 8 November 1944. Took St. Die France, 23 November 1944. Fought with 7th Army over 500 miles in France (Alsace), Germany, and Austria, to the Brenner Pass in Italy. Liberated Kaufering Concentration Camp, near Landsberg, Germany 27 April, 1945. Engaged in 34 battles from Nov. 44 until May 45, including Alsace, France. Crossed into Germany 16 December 1944. Assaulted the Siegfried line Dec. 44 and again March 45, sustaining heavy casualties. In defensive positions near Sarreguemines area during German operation “Northwind” that followed the Battle of the Bulge. Crossed the Meurthe, Zintel, Lauter, Moder, Rhine, and Danube Rivers. The German 19th Army surrendered to the Division 5, May 1945 at Innsbruck, Austria. Sculpture “A Call to Duty” Dedicated November 11, 2006. Donated to America and the City of Gainesville, by the Texas WW II Historical Monument Fund and the 103rd Infantry Division Assn. of WW II with the assistance of the City and citizens of Gainesville, Texas; Gainesville VFW 1922; civic clubs of Gainesville; Texas Land Commission; Texas Historical Commission; Texas Veterans Commission; Texas Department of Transportation; and many friends of the 103rd veterans. On behalf of our generation we are leaving this history for future generations. God Bless America, and Keep Her Free. Maj Gen Charles C. Haffner – Nov. 1942- Jan. 1945; Maj. Gen. Anthony C. “Nuts” McAuliffe – Jan. 1945 – July 1945. The War Department activated Camp Howse on August 17, 1942 as an Infantry training facility. It covered 58,000 acres of rolling plains northwest of Gainesville, in Cooke County, Texas. The camp was designed as a temporary post. Most buildings were single wall wood construction covered with black tar paper. Troop Quarters buildings would sleep one platoon of 40 men and were heated by a simple coal stove at each end of the building. During 1942-1946 three Infantry Divisions and a number of smaller units (estimated at nearly 90,000 soldiers) received training there prior to combat action in Europe. Beginning in 1943, the post also served as a prisoner of war camp for nearly 3,000, mostly German, prisoners. Camp Howse was one of 15 such camps. Prisoner repatriation began in January 1946. The camp was deemed surplus and dismantled in the fall of 1946. The economic and social impact of Camp Howse on Gainesville was instrumental in the town’s rapid growth. It also provided temporary housing for the city during the housing shortage at the end of the war. The land that composed the camp was later offered for sale to its former owners. Five large markers are fanned out behind the sculpture, listing the names of more than 800 members of the 103rd Infantry Division who lost their lives in World War II.